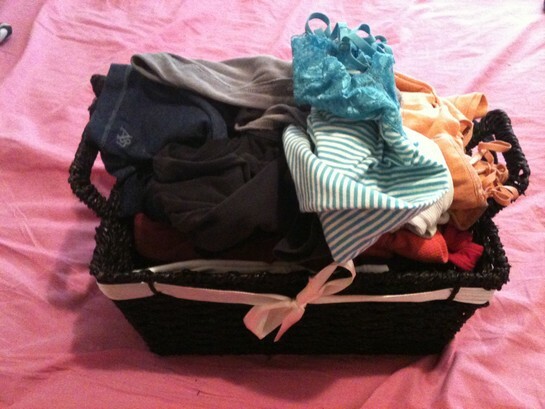 I showed briefly on how I organize my tank tops in my first post I made on here, on how I organize my closet which you can view here, there are many fun and unique ways to organize tank tops, or you can simply fold them in your dresser drawer if you have ton of them. 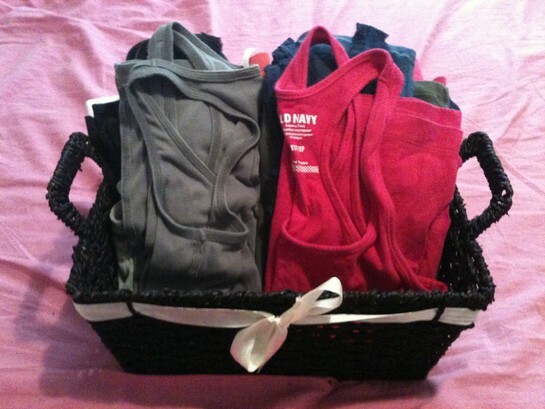 I however LOVE baskets and organizing with baskets, and I don’t have a million tanks, enough for one person and many colors since I only wear these tanks under other shirts, so this method works for me! My basket was beginning to look very messy, and this is my cats very spot to sleep, so usually this baskets gets messy and very hairy every single day, but I love my cat so I don’t mind! I figured since it was a mess this would be a quick and easy blog post to show you how I organize my tank tops more in-depth (there really isn’t much to it). There is really only one step to this process, and that is after I take everything out of the basket, I organize my tank tops by color, and then within the color I organize by style, most are the same but I have v-necks, and razor back tanks so I like to organize by style as well, and then I go ahead and put each section so the colors on my side of the basket and my more neutrals on the other side of the basket. If you have way more tanks than I do, you can probably get two baskets and put all your colored tanks in one basket and all your neutrals in another, my basket is pretty full, but if I buy anymore I will probably need another so It’s not so stuffed full! I hope you enjoyed this simple post on how to organize cami’s, if you have different way that is effective please share below, I would love to see! Thanks for sharing your very practical advice regarding an essential wardrobe garment! Great idea!